Here was your bargain for small change it took to get into theatres during 1929: a Paramount feature, Street Of Chance, plus Eddie Cantor in the one-reel Getting A Ticket, with talking and song, the bill running five weeks at Broadway's Rialto for prices way less than vaudeville audiences were then paying to see Cantor. Part of what killed vaude was stars recording their acts on film. Eddie was in midst of "a whole Cantor series on Paramount's short program," their trade emphasis on fact that "capacity crowds" gave $5.50 per seat to see him on stage. A widest gulf between movies and big-time vaudeville was cost, and with talkies' grip tightening, there was no doubt left as to which would prevail. 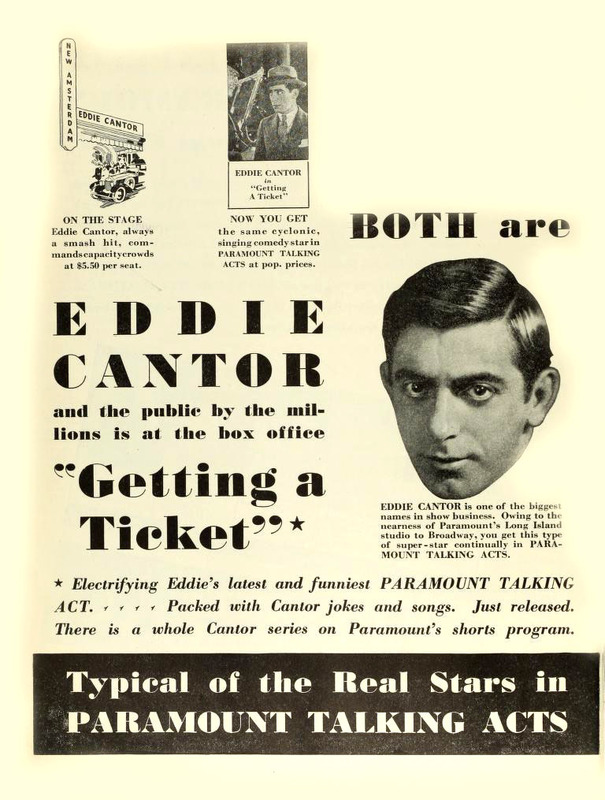 Eddie Cantor still commanded top money to play New York's Palace Theatre; in fact, his price for live performing went up as other media, radio in addition to film, utilized Eddie more ($7,700 per Palace week in 1930, $8,000 the following year). Getting A Ticket was eleven minute mix of what Motion Picture News called "old wheezes on the stock crash" and a song entitled My Wife Is On A Diet, the second half of which "might be objected to in family circles," said the trade, but anyone going in knew Cantor's stuff could be bawdy, and it was that in fact that brought a lot of them in. Getting A Ticket is part of Kino's DVD Cavalcade Of Comedy, the only disc so far extant of "Paramount Talking Acts," which just shows how deprived we home enthusiasts remain when it comes to early talkie comedies. I wonder about specific acts. Were bookings for a given act helped or hindered when it out there on film? 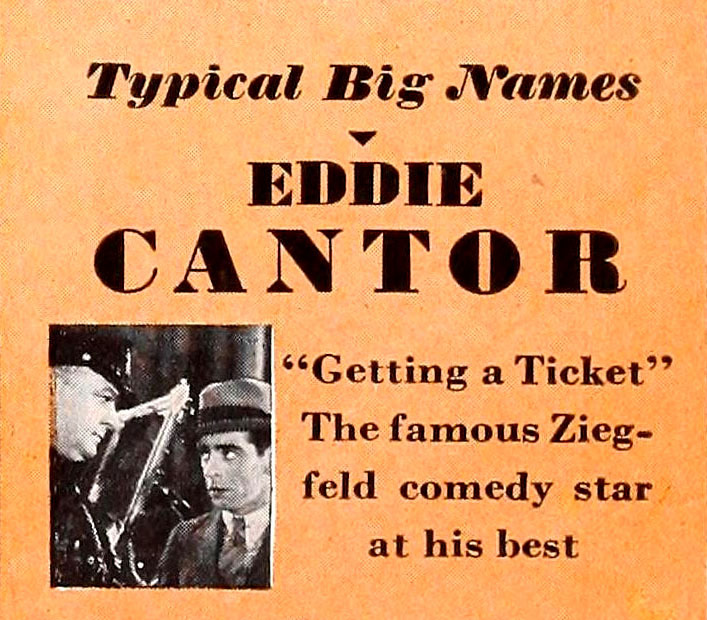 I can imagine that a star of Cantor's magnitude would benefit from films (and records, for that matter). Performers who were known more for style and characters rather than specific routines could draw with new material AND their unique schtick. Thus Burns and Allen could smoothly carry their act from vaudeville stages to 50s sitcom suburbia. But what about elaborate comedy routines and novelties? That same DVD has "Plastered", three guys in slapstick routine that likely played unchanged for years. There were a lot of such acts, often involving elaborate props and sets (the guy in "The Plasterers" seems to be sleepwalking) that mitigated against updating. Then there were stars who were so defined by a given piece they felt it was risky to change, like an old rock band with a greatest-hits set list. Did they have trouble if they hit town after their short had played and given away all the surprises? Or at least as bad, revealed that they'd aged or gotten raggy in their execution? Were there acts that suffered because a key gag or bit was lifted by somebody else for a film? Bert Lahr always felt his career was damaged when his first Broadway hit, "Hold Everything", was filmed with Joe E. Brown -- who was evidently directed to duplicate Lahr's vaudeville-honed character. Worst of all, were there acts so weak (or poorly filmed) that the shorts warned off theaters from booking the originals? A bit later the same basic questions would return when novelty acts suddenly had a paycheck -- and mass exposure -- on television (See Mark Evanier's pieces about "The Banana Man" and others). And again later, when everybody was a standup comic. I hate to say it, but it wasn't the movies that killed vaudeville, in fact, they had played together for years at this point, and would actually continue to for several more decades. Two things one must realize, yes, there were acts that were honed and didn't change one iota like the Plasterers act (in fact, there are even two different variations on that act in the mentioned Kino DVD)and they brought that act to the same towns year after year and audiences in those towns still came to see them, and considering the way movie distribution was in those days, these Vitaphone or Paramount vaudeville shorts would play a theater in a certain town once for probably no more than three days, and most likely never be seen at that theater or frequently town or city again, it was no more than a single booking in that town lost for the vaudevillians. After seeing more and more of these early talkie vaudeville shorts, the more I realize that it was vaudeville that killed vaudeville. For every Burns and Allen in LAMBCHOPS, or Eddie Cantor in INSURANCE, how many painfully bad or generally mediocre Vitaphone shorts with acts we never heard from again have we all now seen? The really good performers got better gigs elsewhere, like the movies, radio, Broadway, night clubs what have you, the not so good, well, we hope they went on to happier lives and careers, but even some good ones like the rediscovered Shaw and Lee actually continued to work in vaudeville and make good livings at it into the 1950's. The big myth is that vaudeville dies out so quick once talkies came in, it didn't, like all these media declared dead by some pundits with the arrival of a new medium, it went way more slowly, and changed. How many newspaper ads has John shown us featuring movies along with any number of live stage acts? That's vaudeville, and it continued and morphed out into other venues of live performance like nightclubs concert halls, and hotels and state fairs and other places live acts continued to work, and outside the US, vaudeville and variety remained popular even longer, remember how many of Ed Sullivan's acts were from other countries. I agree with Richard. Plus, those stars whose acts and personalities were flexible enough, naturally were drawn to radio and film. Almost all the great comedians of radio and film began in vaudeville but outgrew it. ANYONE with star talent left vaudeville behind, meaning those who remained were second-rate players or specialty acts. That's my belief, at least. What vaudeville gave those performers was a keen sense of timing. Vaudeville theaters sat thousands. As David Mamet points out in TRUE AND FALSE, the audience is the only teacher. Those people learned their art in a way present day performers never can. Often those shorts were used to promote acts in the towns they played. I saw Eddie Cantor in ZIEGFELD MIDNIGHT FROLIC with a 2006 house, and I was amazed at Cantor's infallible timing. He told a joke about Henry Ford, went right into the next story, and stopped while the 77-years-later audience laughed. He waited it out and resumed when the audience laugh subsided. Amazing to see a 1929 performance become an interactive experience! Hearing songs on radio and seeing and hearing videos of performers on television and the internet does not stop people from going to live concerts today. A large part of the attraction was seeing live acts that were good enough for the movies. That gave them added stature. That Cantor pause says a lot. It comes from knowing how the audience will react and that they must be given time to react. That is why films from that period may seem slow watching them by ourselves. The movie experience is a shared experience. It works at its best when it is one. Raymond Rohauer and I ran Eddie Cantor's GETTING A TICKET and INSURANCE for Joe Smith (of Smith & Dale) at the Actor's Home in Englewood, NJ in 1979. It turns out that Joe Smith had written GETTING A TICKET as a sketch for Cantor after Smith was stopped by a motorcycle cop for speeding. The policeman had show biz aspirations, and he traded quips with Joe. Eddie bought the sketch from Joe for $1,000, then turned it over to his gagman Dave Freedman to "punch it up." Joe Smith died at the Home in 1981, still sharp in mind and body, at the ripe old age of 97. That's some great info, Ed. Thanks for passing it along. From the sound of that Raymond Rohauer was a much better man than many like to paint him.